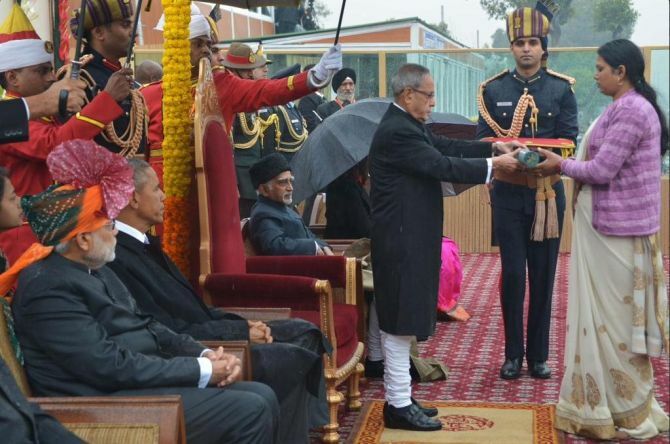 Major Mukund Varadarajan's wife accepts the Ashok Chakra, India's highest peacetime gallantry award, from President Pranab Mukherjee at the Republic Day celebrations on Monday. Two army personnel, who laid down their lives combating militants in Kashmir, have been selected posthumously for the Ashok Chakra -- the highest peacetime military honour of the country. 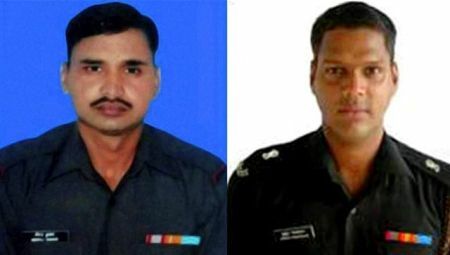 Major Mukund Varadarajan and Naik Neeraj Kumar laid down their lives while battling groups of militants in separate operations in Shopian and Kupwara districts of Kashmir respectively, Udhampur-based defence spokesman Colonel S D Goswami said. “Major Mukund Varadarajan, Company Commander, received information about the presence of three terrorists in village of Shopian district of Jammu and Kashmir on April 25, 2014. This group had targeted polling officials just a day prior. "Major Mukund acted swiftly by deploying troops in an effective cordon and simultaneously evacuated civilians from the target house,” the spokesman said. He said Major Mukund led from the front the demolition team and used the resources available to him in a critically short time period to bring down the target house. “This aggressive action forced the terrorists to shift their position to an outhouse in the compound. Major Mukund along with his buddy Sepoy Vikram displaying raw courage, crawled in proximity to the outhouse. The officer lobbed a grenade inside the cement outhouse killing one terrorist instantaneously. Another terrorist present in the outhouse opened a burst of auto fire thereby seriously injuring Major Mukund,” he said. The spokesman said although bleeding profusely, the officer crawled ahead unmindful of his grave injury, fired and neutralised the second terrorist. “The elimination of terrorist avenged the killing of the election officials within 24 hours and restored faith of public in democracy and the Indian Army. Major Mukund Varadarajan was evacuated but succumbed to his injuries,” he said. 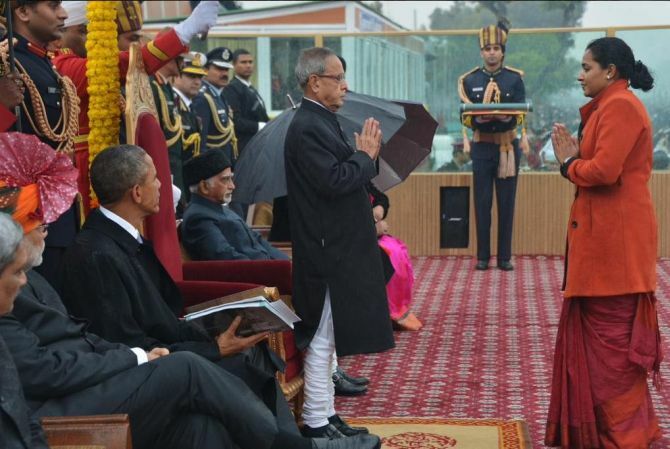 Naik Neeraj Kumar's wife accepts the Ashok Chakra, India's highest peacetime gallantry award, from President Pranab Mukherjee at the Republic Day celebrations on Monday. Naik Neeraj was part of the team that carried out a search and destroy operation in Kalaroos area of Kupwara district on August 24 last year. “The party noticed movement of few terrorists close to a Dhok, who opened indiscriminate fire on own troops. In the ensuring fire fight, buddy of Naik Neeraj was hit on bullet proof jacket. With utter disregard for his personal safety, Naik Neeraj crawled and extricated his buddy. “A terrorist threw grenades and brought heavy fire on Naik Neeraj. In a daring act, he inched closer to the terrorist and shot him dead,” the spokesman said. He said Naik Neeraj Kumar was attacked by another militant resulting in dropping of his Rifle and the terrorist shot him in the chest. “Despite grievous injuries, displaying unparalleled courage, he pounced on the terrorist, snatched his weapon and killed him in hand to hand combat,” he added. The spokesman said Naik Neeraj refused to be evacuated till he became unconscious and was evacuated by helicopter to 92 Base Hospital, where he succumbed. Don't be fooled by the hug!